These two tabs of the Options dialog allows setting values relevant to the IDE progamming environment. Initial Package: specifies the value returned by the default initial-package method. Use Single IDE Parent Window: specifies whether the use-ide-parent-window option is enabled. If checked, the IDE will use a single parent window that encloses all of its tool windows. If unchecked, it will instead use a single owner window that lets the various tool windows float freely on the screen. The unchecked option does not work well on X11 platforms. A change to this option will be in effect only when you restart the IDE (and a dialog will remind you of that). Start in Allegro Directory: specifies the default (checked is True, unchecked is nil) value returned by start-in-allegro-directory. Checking this box is usually only necessary if you start by double-clicking a dxl or exe file or by a custom Emacs command. Ask for Action at IDE Startup: if checked, the Startup Action dialog will appear when the IDE is started. This dialog asks whether to open a recently-used project, open some other project, create a new project, or proceed without a current project. Confirm Exit Request: if checked, an exit gesture (such as clicking on the Close box of the Project Window) will cause a dialog to be displayed asking if you really want to exit. See query-exit. Confirm OS Shutdown Request: if checked, an attempt to shut down the operating system will display an exit confirmation dialog even when there are no unsaved changes in the IDE. See query-os-exit. 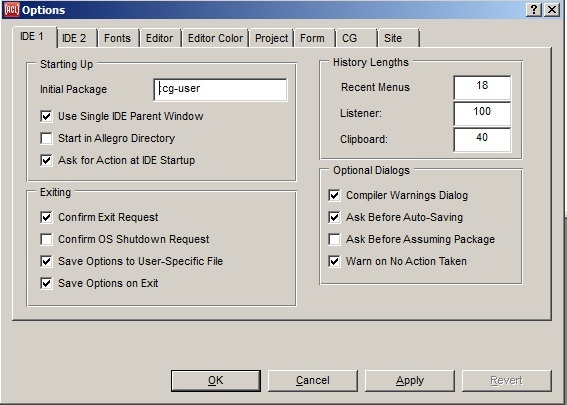 Save Options to User-Specific File: if checked, options are saved to a file specific to the current user rather than to the global allegro-ide-options.cl file. See save-options-to-user-specific-file, where determining the name and path of the user-specific file is discussed. Save Options on Exit: if checked, options including such things as window location and size, are automatically saved to the file specific to the current user or to the global allegro-ide-options.cl file on exit. See save-options-on-exit. Unclicking this (and applying) makes the current Lisp not save its options. In order to get the options file to specify that options should not be saved on exit, the current options with Save Options on Exit unclicked must be saved. Recent Menus: the value, which should be a positive integer, specifies the maximum number of items that will be retained in each of the submenus of the Recent pull-down menu. See recent-limit. Listener: the value, which should be a positive integer, specifies the maximum number of recent evaluations that will be kept in the debug window's history list for possible re-evaluation later. See debug-history-limit. Clipboard: the value, which should be a positive integer, specifies the maximum number of cut or copied objects that the clipboard will hold. See clipboard-history-limit. Ask Before Auto-Saving: if checked, you are asked before files (such as project files) are saved automatically. See ask-before-auto-saving. Ask Before Assuming Package: if checked, you are asked before an IDE command will use a symbol in another package when the selected string does not name a symbol in the current package. See ask-before-assuming-package. Warn on No Action Taken: if checked, a dialog appears when an action is requested but cannot (for some reason) be performed. See warn-on-no-action-taken. Show IDE Help Within the IDE: if checked, IDE help commands will display help in the IDE's own help window rather than in a third-party HTML browser. See use-cg-html-browser. Close Inactive Listeners: if checked, listener panes that become inactive will close automatically. See close-inactive-listeners. Symbol Completion in All Pkgs: if checked, a search for symbol completions will search all packages for possible completions if the specified package (when the partial symbol entered has a package qualifier) or the current package (when the partial symbol does not have a package qualifier) contains no possible completions. See symbol-completion-searches-all-packages. Context-Sensitive Default Path: if checked, affects the initial directory of file management dialogs displayed by Lisp. See context-sensitive-default-path for an explanation. Move Windows on Screen Resize: if checked, IDE windows will be automatically moved and resized when the screen size changes (if the IDE parent window is maximized). See move-ide-windows-on-screen-resize. Compile Files as UTF8: if checked, interactive compilation and loading commands will use the UTF8 external format, and otherwise will use the default external format (except when the commands are used in the editor, where the format is determined from the file contents and other IDE options). See compile-files-as-utf8. Lisp-Message Print Level: the value of *print-level* when printing status bar messages. See lisp-message-print-level. Lisp-Message Print Length: the value of *print-length* when printing status bar messages. See lisp-message-print-length. The multi-item list shows the various possible toolbar icons either selected or not (all the illustrated ones are selected; you would have to scroll down to see unselected ones). All unselected icons are on the Extended Toolbar, displayed (as a floating palette) by the View | Extended Toolbar command. If you change which icons are selected and apply the changes, the toolbars are redisplayed according to your choices. A gap is the vertical line dividing groups of toolbar icons. Backtrace-Print-Circle: the value of *print-circle* in a backtrace. See backtrace-print-circle. Backtrace-Print-Level: the value of *print-level* in a backtrace. See backtrace-print-level. Backtrace-Print-Length: the value of *print-length* in a backtrace. 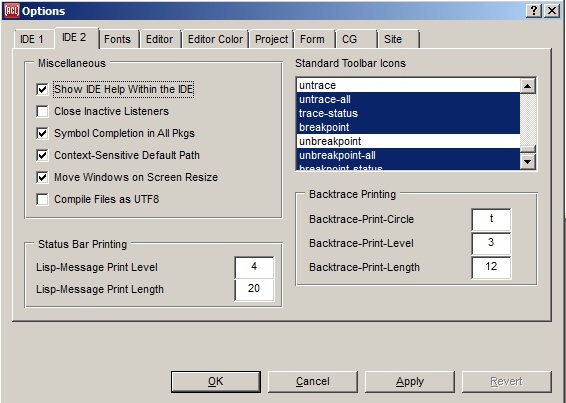 See backtrace-print-length.